(Tampa, FL)- In the third and final regatta of the J/70 Davis Island Winter Series, fifty-five J/70 teams are hoping to sail in the forecasted winds of 10-20 kts from the northeast this coming weekend. Should that happen, that would more than make up for the fact that in the two previous events there was only one good day of racing both times; ironically both on Saturday, with Sunday being washouts for either no wind or storms. Who will ultimately triumph in the 2018-2019 edition of the DIYC J/70 series? It is all up for grabs, that is for certain. Teams only have to count all races in their two best regattas. Given the somewhat “yo-yo” scorelines for most teams in the first two events, virtually anything can happen for the overall standings. Current leaders include Travis Odenbach’s B-SQUARED team; Doug Strebel’s BLACK RIVER RACING from Houston, TX; Kevin Downey’s MR PITIFUL from Seattle, WA; and local Tampa rock stars on Greiner Hobbs’ DARK HORSE. In the Corinthians Division, Andrew & Melissa Fisher’s BUTTON FLY and Bob Willis’ RIP RULLAH appear to be significant players to remain at the top of the leaderboard after the battlefields clear over the weekend. 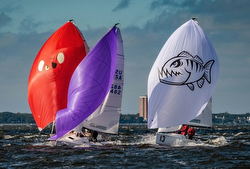 For more J/70 Davis Island Winter Series sailing information Add to Flipboard Magazine.